Snakes are one of the most dreaded and feared creatures in the entire Animal Kingdom. Though many religions have depicted snakes to be holy and to be worshipped, but still, most of the human race is obsessed with attaching the tag of fear with anything that is related to snakes. India, with its vast variety of climates and natural vegetation, is home to more than 200 species of land snakes. It is therefore, obvious that encounters with snakes is very common all around the country. And so, it is all the more essential to know important facts about snakes, contrary to myths that go around demonizing all snakes. The most important thing when finding a snake unexpectedly is to find out whether it is a venomous or non-venomous snake. The following chart makes it easy to ascertain this very fact. One is not expected to encounter a King Cobra usually, unless one ventures deep into the dense rain forests, which are the homes to this highly poisonous snake. 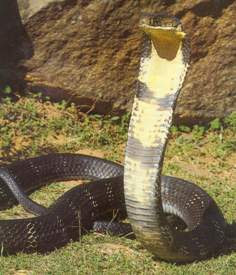 The King Cobra can be identified by its large size (upto 12-13 feet) and a “^” sign on its neck. It does not bear the usual ‘spectacle’ mark like the common Cobra. It’s venom is neurotoxic (affects the nervous system) as well as slightly cardiotoxic (affects the heart). One of the most commonly recognized of Indian snakes, the Cobra is easily identified by its hood and a single or double spectacle mark on the hood. Though the hood cannot be seen in a dead Cobra, the snake retracts its hood usually while in motion. It can grow to a length of 2 metres. 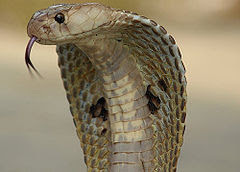 The common Cobra is a somewhat aggressive snake, having a neurotoxic and slightly hemotoxic (affects the blood) venom. The Krait is probably the most common poisonous snake found across India. 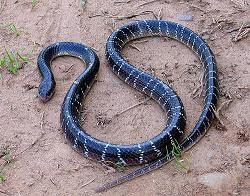 Though it is smaller than a cobra in length, it’s body is darker in color ranging from a blue-black to a bluish grey. The most striking mark of identification is the presence of white cross bands throughout its body. It is essentially a nocturnal hunter and is seldom encountered during the day. It has an extremely neurotoxic venom which leads to rapid muscle paralysis. It’s venom is much more toxic than that of a cobra. The Russel’s Viper is another common Indian poisonous snake which is less closely associated with human settlements than cobras or Kraits. It is also a nocturnal hunter ,but ,becomes diurnal during cool days. When threatened, they curve their body in the form of ‘S’ shaped loops and produce a hissing sound louder than any other snake. They can be easily identified by the presence of 3 series of dark brown spots on the back of a yellow, tan, or brown body. The important point in the identification is the presence of a black ring around each of these spots and further intensified by a rim of yellow or white. 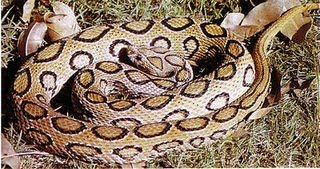 There are other harmless snakes with similar dark spots on their backs, but they are not circumscribed by a black ring. The Russel’s Viper has a highly hemotoxic venom. It is a small snake which may grow up to two and a half feet. It has small, white, diamond-shaped and somewhat square patches along the middle of the back. The head has a distinct white mark, which may sometimes resemble a trident. When disturbed, it coils itself up in the shape of the figure ‘8’. 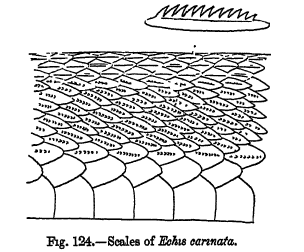 It rubs its body producing a sound like that of sandpaper. 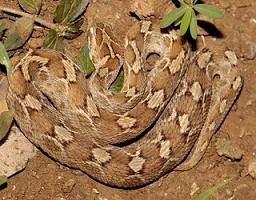 Each of its scales is ridged in the middle like a saw, hence its name, the saw-scaled viper. Its venom is highly hemotoxic. Though the above five are the only poisonous snakes one can find in India, the various sea-snakes are an addition to these poisonous snakes, as all sea snakes are deadly poisonous. But it is rare to encounter a sea snake commonly. Apart from these, the only other snake which can cause some harm to humans is the Python. But pythons are usually very lazy creatures and not usually big enough to trouble adult humans. In spite of the presence of such common poisonous snakes around human habitat, still the most commonly found snake in everyday-life is the harmless ‘Rat-snake’. It is a dull colored average sized snake which feeds on rodents as its name suggests. It is commonly mistaken to be poisonous, and hence is killed. One can find the various remedies for a snake-bite all around. But what is important is to keep a few important tips in mind when encountering a snake. Do not panic and run around on seeing a snake. There may be other snakes around too which you might step upon. Stay dead still if you are within striking distance of the snake. Hold your nerves. Do not disturb or provoke the snake. It will more often than not move away from you itself. 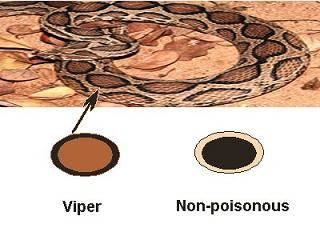 Using the above features, try to identify whether the snake is poisonous or not. But do not try to handle it by yourself or by any stick or any other object. Never try your agility even if the snake looks tired and still. It can attack with the quickest of reactions if you get too close. Most importantly, do not kill the snake just because it is a snake. Snakes are living beings too and will not harm you unless you disturb them. Happy New Year! How have you been? Long time.. Very informative....I am a post graduate in Biochem...I can feel the connect. Thanks for visiting my blog. Thanks a lot ! Glad you liked the post. I wish you offered a chart to send out to people curious about snakes and the types to avoid! Though the above are the only types of poisonous snakes found in India, I'll still try to do a chart as per your suggestion.